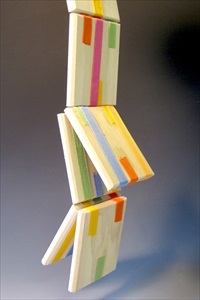 A Jacob's ladder is a folk toy consisting of blocks of wood held together by strings or ribbons. When the ladder is held at one end, blocks appear to cascade down the strings. However, this effect is a visual illusion which is the result of one block after another flipping over. The mysterious movement of this puzzling toy has fascinated generations of American children. Described in Scientific American (1889) as a “simple toy – very illusive in action”, the Jacobs Ladder still confounds us with its seemingly inexplicable motion. Create the Jacob’s Ladder effect by holding the top block with the single ribbon facing outwards. Then, rotate your wrist forward and backwards. The wooden panels will appear to cascade down. Perform tricks and create cool shapes. This classic toy is fun for the entire family.